Due to Easter, we are closed from April 19 to April 22. You can simply send your order, quotation or contact request. If necessary, we will contact you from Tuesday, April 23. Please enter a search term with at least 3 characters. When you need a bag, a bag made of Seed Paper might not be the first thing that comes to mind. Yet this is the ultimate in unique and sustainable bags. 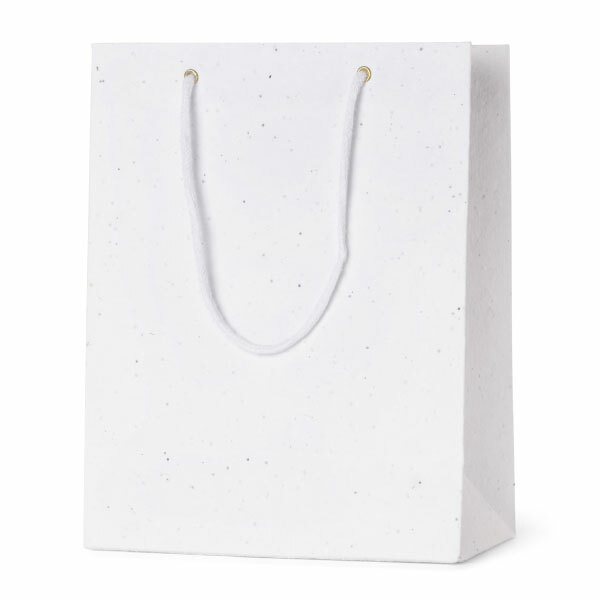 Our Seed Paper bags are ideal for trade fairs or events. The bags can be supplied in three different formats as standard: small (28 x 22 x 11 cm), medium (35 x 26 x 11 cm) and large (40 x 32 x 12 cm). The Seed Paper bags are made of 200 gr. /m2 recycled paper with flower seeds in-between. The bags are finished with luxury cotton handles. When printed with your own logo or text, a bag made of Seed Paper is a wonderful way of promoting your company and one your clients or associates are sure to appreciate. Why bags made of Seed Paper? What makes the bags so special is that they can be used a number of times and when they show signs of wear, you need not throw them away like other bags. You see, bags made of Seed Paper can be buried in the ground. With sufficient sunlight and water, the paper degrades in a few days and the seeds germinate. Shortly thereafter, you have a colourful mix of blossoming summer flowers! A bag made of Seed Paper is thus an exceptionally environmentally friendly and ecologically responsible product. If you give these bags away as corporate or promotional gifts, they are sure to be well received because your clients or associates can see that you are doing your bit for the environment. There is no greener or more sustainable marketing tool! 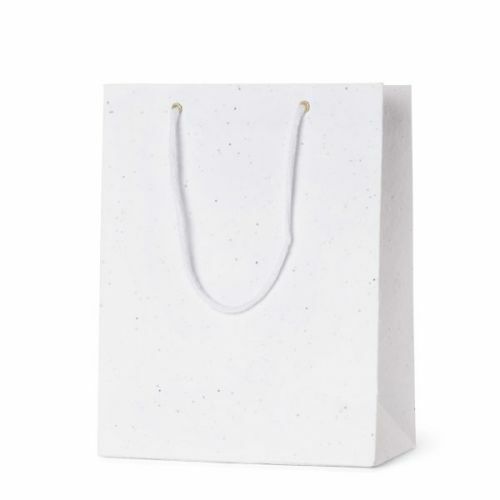 You can order unprinted Seed Paper bags, or you can have them printed with your own logo, image or slogan. Printing is done by means of screen-printing, so up to four different PMS colours can be printed. Prior to printing, we send you a digital proof so you can see how your Seed Paper bags will be printed. The printing department only starts the printing process after approval. Bags made of Seed Paper are thus exceptionally green and ecologically responsible, an asset to your company!